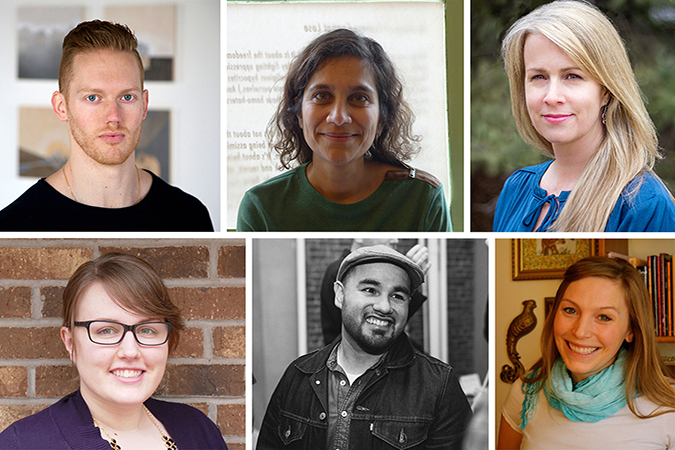 The six finalists for this year's Lindquist & Vennum Prize for Poetry were chosen from more than 200 submissions. The annual award, established in 2011, is open to poets in Minnesota, Iowa, North and South Dakota, and Wisconsin. It is co-sponsored by the Lindquist & Vennum Foundation and Milkweed Editions. Angela Voras-Hills lives in Milwaukee, Wis., and is co-founder of Arts + Literature Laboratory in Madison. Her work has appeared in Kenyon Review Online, Hayden's Ferry Review, and Best New Poets, among other places. She has received awards from the Key West Literary Seminar, the Writers' Room in Boston, and the Sustainable Arts Foundation. Patrick Johnson lives in Madison and is studying to become a physician assistant. He holds an MFA from Washington University and some of the poems in "Gatekeeper" have been published in various publications. Michael Torres grew up in California and now lives in Mankato, where he teaches creative writing and co-hosts "Notepad Poets," an art workshop for at-risk and homeless youth. His work has appeared in Green Mountains Review, Forklift, Ohio and Tinderbox Poetry Journal and he has received grants from the Minnesota State Arts Board and the Jerome Foundation. He was a 2016-17 winner of the Loft Mentor Series. Caitlin Bailey lives in St. Paul and holds an MFA from Hamline University. Her poems have appeared in Prairie Schooner, Carolina Quarterly, Hayden's Ferry Review and elsewhere. Soham Patel is the author of three chapbooks: "and nevermind the storm," "New Weather Drafts," and "Riva: A Chapter." She is a Distinguished Dissertation Fellow in the University of Wisconsin-Milwaukee's Ph.D. program in creative writing and serves as a poetry editor for cream city review. Paige Riehl lives in St. Paul and is a former winner of the Loft Mentor Series. She is the poetry editor for Midway Journal and teaches at Anoka-Ramsey Community College. Her work has appeared in South Dakota Review, Nimrod International Journal, Portland Review, and elsewhere. The finalists will be honored at 5:30 p.m. April 13 at Milkweed Editions in the Open Book Building, 1011 Washington Av. S., Mpls., with a poetry-themed cocktail party. At 7 p.m. the party will move to Target Performance Hall for a reading. The winner will be announced on April 19, selected by poet and judge Srikanth Reddy. Marlon James in conversation: "All the people I believe in believe in books."